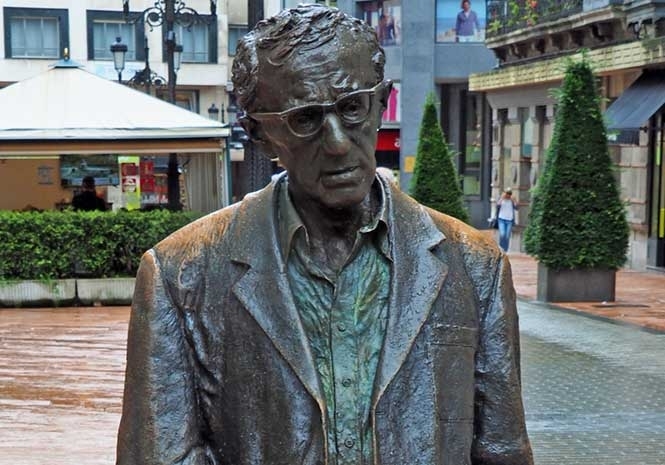 A WOMEN’S group in Spain is demanding the removal of a statue of comedian, actor, writer and film director Woody Allen. Allen’s adopted daughter, Dylan Farrow, has recently renewed allegations that Allen ‘touched her inappropriately’ when she was just seven-years-old. Dylan was adopted by Allen and then-wife, actress Mia Farrow. Allen denies the allegations and claims his ex-wife Mia coached their daughter into levelling the accusations during a messy divorce. The bronze statue of Allen, designed by Vicente Menéndez Santarúa, has stood in the city of Oviedo since 2003. Some scenes in the 2008 romantic comedy-drama film “Vicky Cristina Barcelona”, written and directed by Allen were shot in Oviedo.